From New York to Mumbai, check out our favorite multifunctional spaces. It seems like in recent years, we’ve seen so many alternative office environments pop up around the world—from Paris to New York City—and each is more flawlessly designed than the last. Whether you work for yourself or have a job that allows you the flexibility to work remotely, these more laidback environments can be just the thing to inspire your creativity and help you network in the process. Here are some of our favorites from around the globe. Centrally located with 16 full floors of office space, this recently-opened space features a mix of desks and offices for optimum working flexibility. Creative touches, like a living plant wall and artwork from local artist Akshita Gandhi, make for a more comfortable work environment—because who wants to be answering emails from a stark white cubicle, anyway? Blending the local with the international (natural materials and clean lines are reminiscent of that much sought-after Scandinavian aesthetic), this co-working space has enough variety in its decor and office areas to make every kind of worker feel at home. Another recently-opened WeWork in India, this one is equally impressive… if only due to the venue. 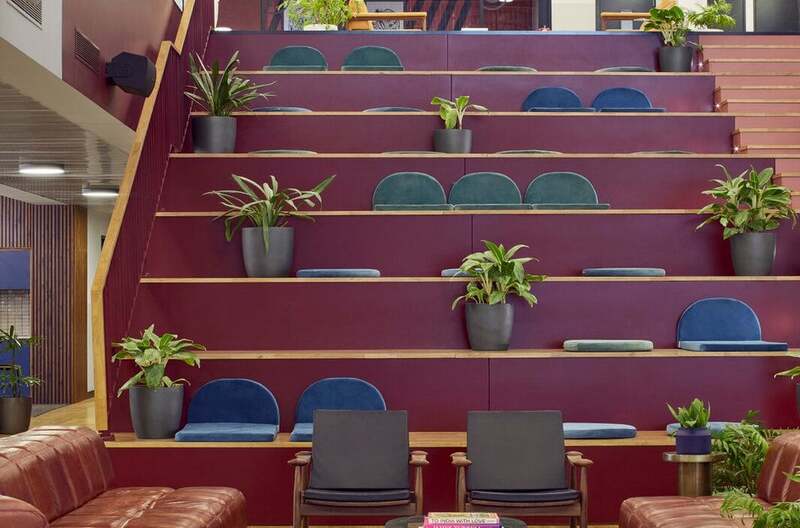 WeWork renovated the historic Galaxy Theater into the six-story office space of our dreams. The building is saturated with color, from turquoise cabinetry in one of the kitchens to earthy green accents and rich maroon tones adorning each floor. A designated wellness room is perfect for stressed-out workers to take five for a meditation break—or alternatively, they can make use of the pool on the rooftop terrace, which overlooks the city. Part social club, part coworking space, The Wing has rapidly become one of the city’s most coveted hot spots. Since launching in late 2016, this multifunctional company has both a Flatiron location and a newly-opened Soho branch with plans to expand to Brooklyn and even Washington DC. Noted for both its core message of female empowerment and its of-the-moment interior design (between the color coordination, mid-century modern lines, and all that millennial pink, it’s basically all of our Pinterest dreams come to life), The Wing has built a clear brand for itself as a young and fun coworking space that’s serious about helping women build each other (and their careers) up in the process. Another coworking space with a strong female voice, Bureau was founded by interior designer Kerra Michele Huerta—so you know the design’s going to be good. Initially created as a studio for Huertas’s team, the designer realized that other female entrepreneurs in the area could benefit from a shared working space. Enter: The (relatively) newly launched Bureau, a coworking space full of bold color moments and punchy sayings that blends the functionality required of an office space with the stylish decor expected of a designer. The light-filled open floor layout of The Hivery makes for potentially the most calming work environment we’ve ever seen. Founded in 2014, it was one of the first women-only coworking spaces, giving it bragging rights in more ways than just the decor. Though it should be said that the design of the place is definitely noteworthy—Wayfair even named it “Best Office Space 2017” at its Trade Tastemaker Awards. The Hivery embodies California cool with its neutral hues and organic textures, relying on sunny pops of yellow to liven the space up. Mission accomplished: Launched in September 2017, this brand new space is already a hub for female entrepreneurs. Created to cater to Toronto’s growing gig economy work environment—according to the Annual Labour Force Survey, 16.6 percent of the city’s working population is self-employed—, the 3,000-square-foot space is colorful, sunny, and functional. An on-trend kitchen features subway tiles and ample meal prep space; elsewhere, phone rooms offer privacy. Inspired by “Les Années Folles,” WeWork’s inaugural Parisian location embodies the rich culture of the 1920s. Opulent features that include a massive mosaic skylight, rich colors in every room, and an overarching theme of Art Deco pay homage to the decade’s signature style. This coworking space offers multiple eateries—dubbed “pantries”—and tons of various seating options, making it a spot you might not even want to leave once the end of the workday rolls around. At the Assemblage, wellness is the name of the game. This coworking space was truly a community effort, with people from over 27 countries providing $150 million in funding to get the business going. While three New York outposts can be expected, the first one recently opened in the Nomad neighborhood, and the emphasis on wellness is evident. From an Ayurvedic food menu to a full-on meditation room to a plant-based non-alcoholic beverage bar, the Assemblage is truly a health-focused haven. And the international community at this trendy coworking space is visible in more ways than just the members. The decor of the place itself seems to pull in design elements from various cultures, featuring vibrant colors, unique light fixtures, an eclectic mix of patterns, and plenty of greenery. Artwork from nearby galleries lines the walls, infusing a bit of the local community as well. This coworking space has a different feel entirely. Crew Collective looks more like a museum or a palace of some historic significance than a place in which to answer emails, which is what we’re assuming is part of the draw. 50-foot high vaulted ceilings and multiple chandeliers pair with marble and bronze detailing for an almost over-the-top luxe feel. This coworking space includes a kitchen and a café for sustenance; plus, members can purchase alcohol to get their happy hour started early if their workday is looking particularly bleak. This story was originally published December 5, 2017. It has been updated with new information.